Last week Ed Vaizey, Minister for Culture and the Digital Economy announced the single biggest expansion of local digital radio coverage, which means that nearly eight million more people will receive their favourite local radio stations on DAB loud and clear. • Radio listening figures – Rajar – show that digital listening has reached 37.9 per cent of all listening hours, compared with 20.9 per cent in Q4 2009. The new transmitters are being jointly funded by the Government, the BBC and the commercial multiplex operators. Work to deliver the infrastructure – which forms part of the Government’s long-term economic plan – will start next month (March) and complete in the second half of 2016. The expansion of local DAB radio will get underway as the expansion of BBC national DAB coverage completes, with 162 new national digital transmitters being built to bring the coverage of BBC national stations on DAB to 97 per cent. 80 of these new national transmitters are now in place with a further 82 to be built by the end of 2015. This programme of new local and national transmitters will mean that the national coverage element of the Government’s radio switchover criteria could now be met by late 2016. • Listen2Digital which is proposing stations including Fun Kids, the Wireless from Age UK, GEM, Panjab and Chris Country. Ofcom plans to award the D2 licence by the end of the first half of 2015 and the new stations could be on air early in 2016. The new network will provide listeners with an extra 15-18 digital stations and increases the number of national commercial DAB stations from only four in 2009 to around 30 by 2016, including some on DAB+. The Minister also emphasised the importance of smaller local commercial and community radio stations. He confirmed as part of a £500,000 Government-funded programme, Ofcom will trial a new small-scale approach to broadcasting on DAB across 10 areas of the UK this summer. The Minister highlighted progress made on the transition to digital radio over the last four years – more than 61 per cent of new cars now come with digital radio as standard, up from 43.5 per cent in Q4 2013 and only 4.4 per cent in Q1 2010 (CAP/SMMT) at the beginning of the Government’s Digital Radio Action Plan. He welcomed the significant shift made by vehicle manufacturers, with 90 per cent of the top 20 manufacturers now fitting digital radio as standard in some or all of their cars. 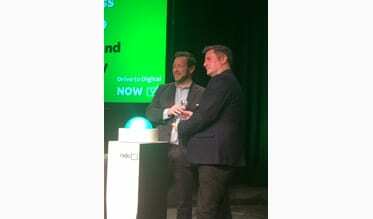 "Halfords is committed to offer our customers the widest range of in-car digital radio in the market with the richly superior listening experience that it offers, and we welcome the significant coverage improvements and the expansion of choice of stations. From early April, all of our digital radio car stereos will be digital tick approved, and with our in-store expertise and nationwide fitting service across 467 shops, will drive further awareness with consumers."